Fiam lounge chairs are made of high-quality materials from the brand’s creative minds. 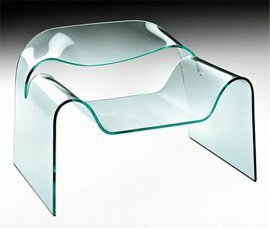 Fiam is an expert in making furniture from curved glass. Fiam glass elevates every product as every design is guaranteed to be modern and elegant. Every piece of furniture moulded by the best Italian makers is stunning, which makes it a great attraction in a room. But as lounge chairs go, Fiam also creates comfortable products in keeping with the brand’s goal of always crafting functional art.